A petition on Parliament's website calling for Brexit to be cancelled has now passed more than 5.7m signatures. The petition to revoke the Article 50 withdrawal process has gained more than one million signatures since Saturday's march calling for a new EU referendum. Theresa May has stressed that the UK had already decided to leave the EU in the biggest ever democratic exercise. But European Council chief Donald Tusk has said revoking Brexit was an option if MPs again rejected the PM's deal. Brexit debate: Do petitions ever work? 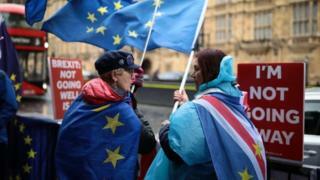 The UK has to decide its next move by 12 April after the EU agreed a plan to delay Brexit beyond 29 March. The prime minister hopes to bring the agreement she has negotiated with the EU back to the Commons for the third time but MPs want other options to be considered as well - and on Monday backed a series of votes to find out the kind of Brexit deal they would support. In December, the European Court of Justice ruled that the UK can unilaterally revoke Article 50 of the Treaty of the European Union, the clause which allows a country to leave the bloc. This means the UK can decide to stay in the EU without the consent of the 27 other member states. Lib Dem MP Layla Moran has said the petition could "give oxygen" to the campaign for another Brexit referendum, a so-called People's Vote. However, speaking on Thursday night after the petition reached the two-million mark, Mrs May said the public had already had their say on EU membership. "They voted in 2016, they voted to leave. I think the time is now to deliver for the British people, the time is now to make the decision," she said. People signing petitions on the Parliament website are asked to tick a box saying they are a British citizen or UK resident and to confirm their name, email address and postcode to sign. The petition was started in February and quickly passed the 100,000-signature threshold needed for it to be debated in Parliament. It began to attract thousands of more signatures last week and at one stage caused the petition website to crash. It reached four million signatures on Saturday, as hundreds of thousands of people marched in central London, making it the most popular to have been submitted to the parliament website. A petition for a second EU referendum in June 2016 attracted more than four million signatures and was debated in the Commons - but thousands of signatures were removed after it was discovered to have been hijacked by automated bots. In January, MPs debated whether the UK should leave the EU without a deal, after a petition calling for that got 137,731 signatures.